Bharti Airtel is now offering 300MB of free data to its customers who update or download the company’s ‘My Airtel’ self-care app on their smartphones. In a move to offer better customer support, Bharti Airtel is pushing its customers to use the company’s self-care app, which is relatively easy to use, and a customers can easily manage or recharge their accounts in a matter of a few taps. As a majority of people who use Internet are regularly using smartphones these days. So, installing self-care apps like My Airtel will benefit both, the end user as well as the company, because the latter could cut down costs by generating information through the app. For these reasons, Airtel is regularly updating their app so they can add new features and improve its customer’s satisfactions. In the latest update to the Android app, the company announced that any customer who are uses a prepaid number can get additional data of 300 MB (100 MB each in 3 continuous months). This offer cannot be combined with existing 50% Night Cashback Offer on Airtel prepaid numbers. 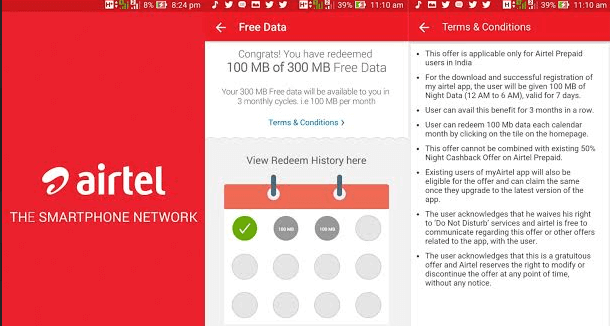 The user acknowledges that he waives his right to ‘Do Not Disturb’ services, and Airtel is free to communicate regarding this offer or other offers related to the app, with the user. The customers who have activated DND on their Airtel number would lose the activation & Airtel can call up them up regarding any offer. Do you think that it is a sweet deal? Share your views through comments.